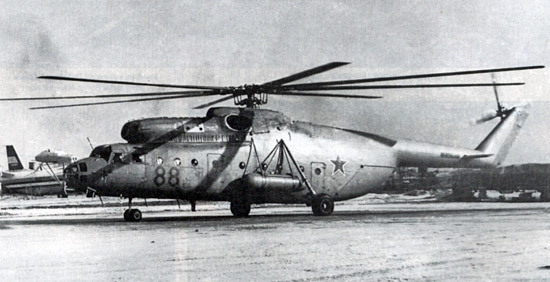 For more than ten years the Mi-6 has remained, dimensionally at least, the world's largest helicopter, and it was also the first turbine-powered helicopter to go into production in the Soviet Union. 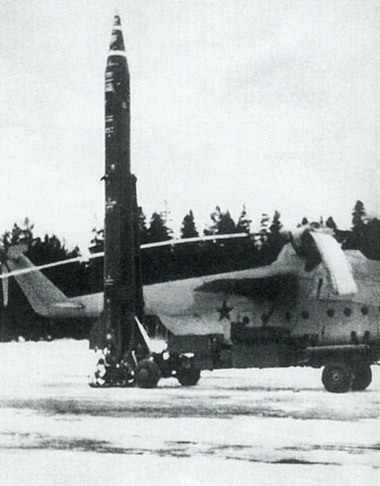 The first of five prototypes, flown by Rafail Kaprelian, made its maiden flight in autumn 1957, originally without the shoulder-mounted stub wings which are sometimes fitted to production Mi-6's. 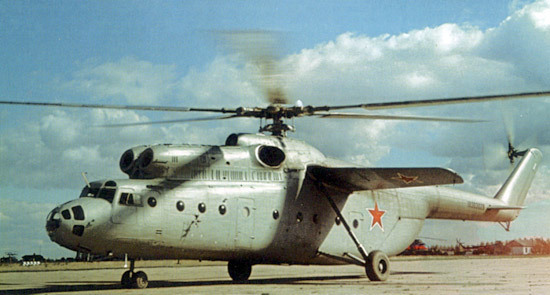 Considering the size of the machine, the flight development period of the Mi-6 was relatively short, and production is believed to have started early in 1960. 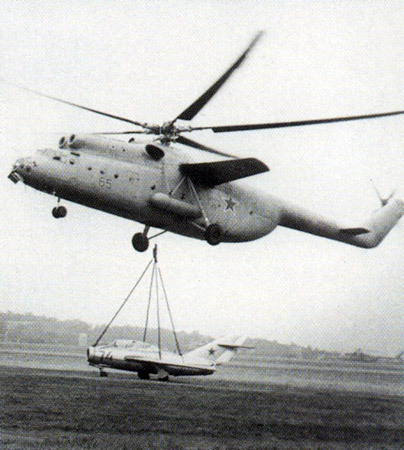 During flight trials the Mi-6 established a number of impressive load-to-altitude and speed-with-payload records in 1959, most of which it bettered three years later when it set a total of eleven new FAI world records. 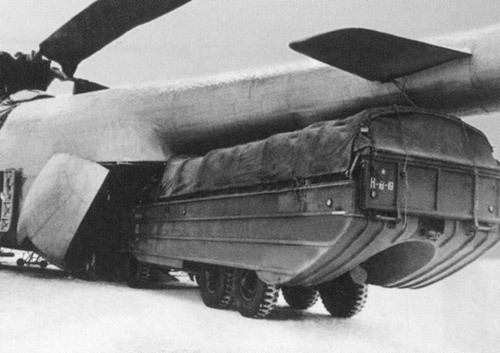 In one of these, still unbeaten by early 1968, it lifted a payload of 20117kg - greater than the entire weight of the biggest helicopter outside of the Soviet Union, the Sikorsky S-64A. 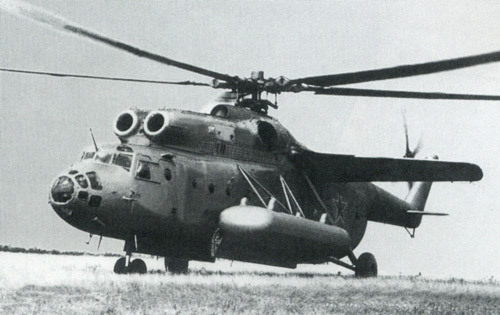 An initial batch of thirty production Mi-6's was undertaken, but this has undoubtedly now been exceeded, since the Mi-6 is known to be in both military and civil service inside the USSR and examples have also been supplied to the air forces of Indonesia, North Vietnam and the United Arab Republic. 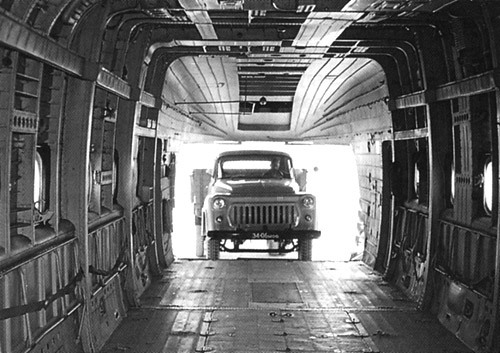 As a military transport the Mi-6 is capable of carrying up to 70 armed troops and has large rear clamshell loading doors for heavy loads such as army vehicles or large palleted items of freight. The Mi-6's in service with Aeroflot are employed mainly as freighters, in which role they have an internal capacity for 12000kg of payload. The standard passenger version seats 65 people normally, although up to 120 persons can be accommodated in a high density seating arrangement. If used as an ambulance, the Mi-6 can carry 41 stretchers and 2 medical attendants. 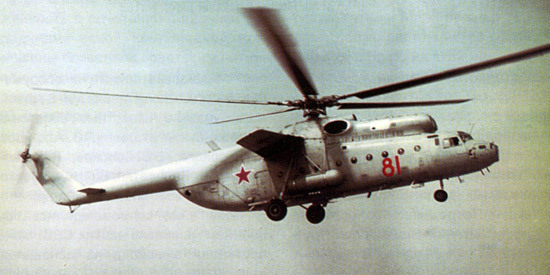 Despite the existence of the later Mi-10, the Mi-6 is still utilised in the flying crane role, when the stub wings (which provide some 20 per cent of the total lift) are usually omitted. The Mi-6 has already demonstrated publicly its ability to airlift such large items as the Vostok space capsule and would clearly be of equal use in large engineering projects, such as bridge-laying or the transport of oil drilling rigs, etc. The under-fuselage hook can support an externally slung load of 9000kg. 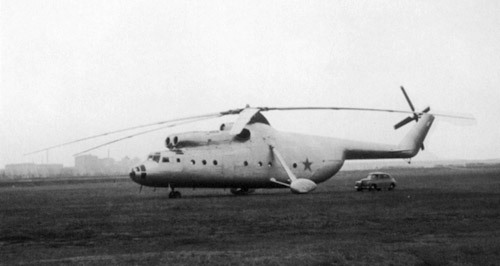 When first announced, following its maiden flight in September 1957, the Mil Mi-6 (NATO reporting name 'Hook') was by far the world's largest helicopter. 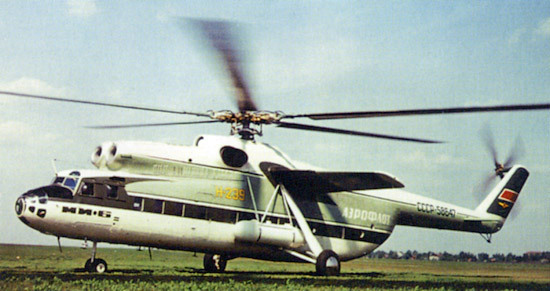 Its maximum payload exceeds the total weight of the Sikorsky S-64A, which on its appearance a decade later was the largest helicopter outside the USSR. Developed to meet both VVS and Aeroflot requirements, the Mi-6 was also the first turbine-powered helicopter to enter production in the USSR. Five aircraft were involved in the development programme, which was completed very quickly for such a revolutionary aircraft, with production beginning in 1960. 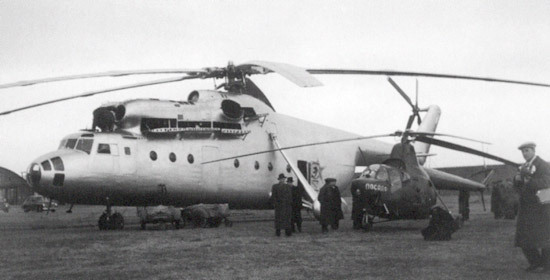 O.f conventional helicopter configuration, the Mi-6 introduced two readily-detachable short-span shoulder wings which offload the rotor by some 20 per cent in cruising flight; for heavy-lift operations the stub wings are removed to give greater payload capability. The Mi-6 was used in 1962 to set up no fewer than 14 speed and height-with-payload records that were ratified by the FAI; four of these remained unbeaten in 1983. Major production version was the Mi-6A of which more than 800 had been delivered when manufacture ended in 1981. The 'Hook' was exported to Algeria, Egypt, Ethiopia, Iraq, Syria, Vietnam and Peru, where it. is used by both the air force and army. Flown by a crew of five, the Mi-6 has also seen extensive use with Aeroflot in civil engineering support work on projects such as bridge-laying, and as a versatile heavy transport in areas inaccessible to other vehicles. Another version, developed into the Mil-10 'Harke', is optimised as a flying crane. 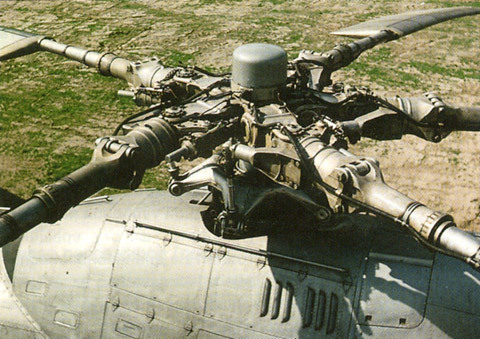 TYPE: Twin-turbine heavy transport helicopter. 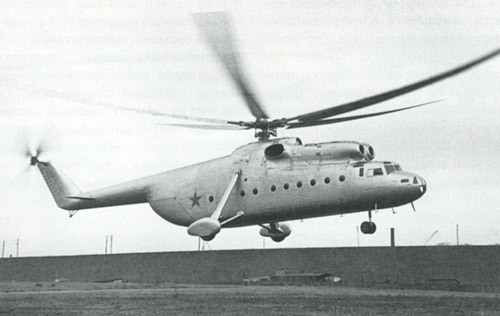 PROGRAMME: Joint military/civil requirement issued 1954; prototype flew 5 June 1957 as by far the world's largest helicopter of that time; five built for development testing; initial preseries of 30 built in 1958 at Moscow-Fili; more than 860 built for civil/military use at Rostov-on-Don, ending 1981; developments included Mi-10 and Mi-10K flying cranes; Mi-6 dynamic components used in duplicated form on V-12 (Mi-12) of 1967, which remains the largest helicopter yet flown. 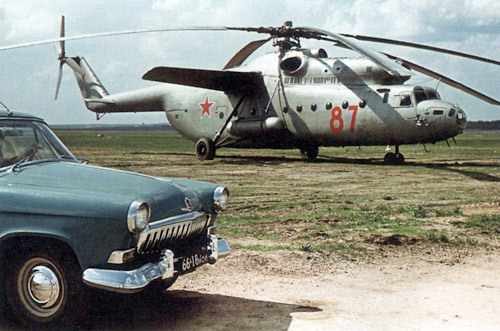 Mi-6 ('Hook-A'): Basic transport with TV-2V. First 30 preproduction aircraft. 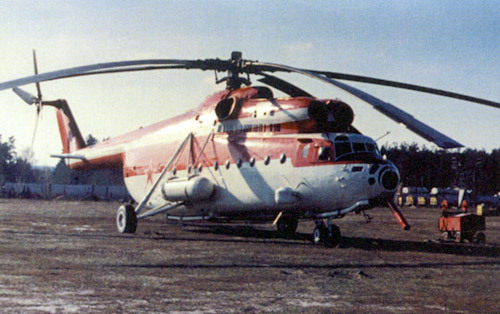 Mi-6A ('Hook-A'): Main production model as described. Mi-6P (passazhirskyi): Airline-style seating for 80 passengers; rectangular windows. 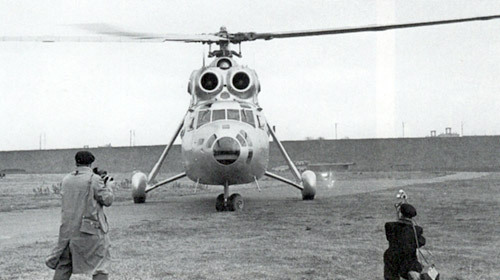 Mi-6PS (poiskovo-spasetelnyi): Military SAR/medevac version, first noted in 1977. 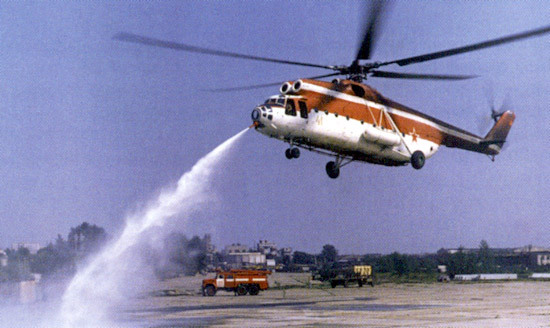 Mi-6PZh and Mi-6PZh2: Firefighters with 21,000 litres capacity in single 12,000 litre metal tank and six 1,500 litre bag tanks suspended from the fuselage. 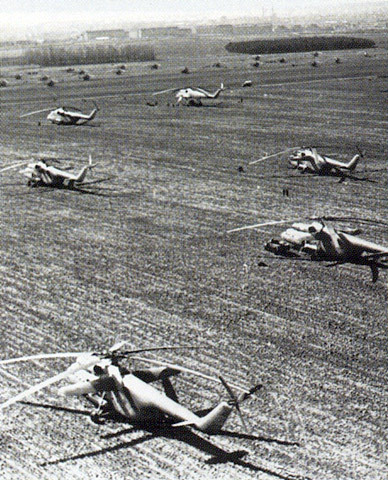 Mi-6S (sanitarnyi): Medevac version for 41 litters and two attendants. 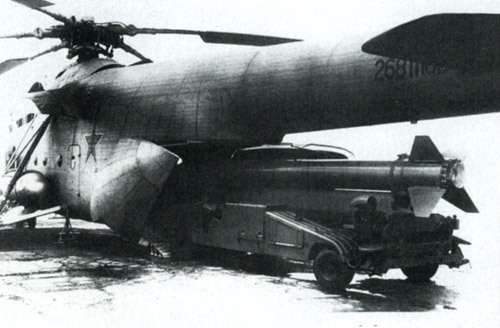 Mi-6T: Basic military transport with machine gun in nose glazing. Mi-6TP (transportno-passazhirskyi): Convertible model with 65 folding seats. 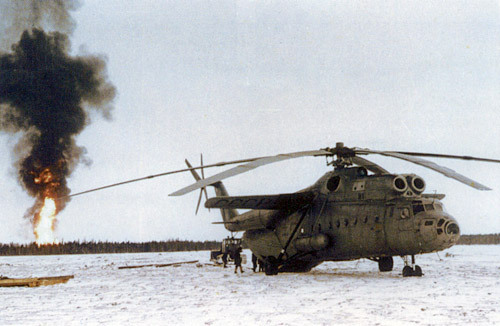 Mi-6TZ (toplivo-zapravshchik): Tanker version for ground refuelling. 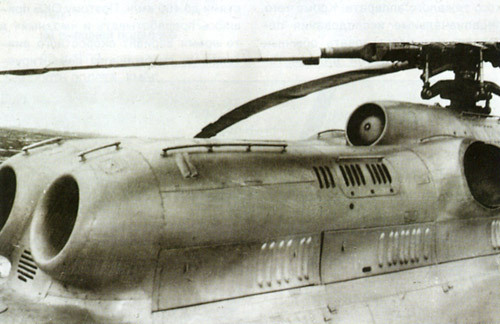 Mi-6VKP (vozduzhnyi komandnyi punkt) ('Hook-B'): Command support version with dorsal 'clothesline' antenna; flat-bottom U-shape antenna under tailboom; large heat exchanger on starboard side of cabin; small cylindrical container aft of starboard rear cabin; small cylindrical container aft of starboard rear cabin door. 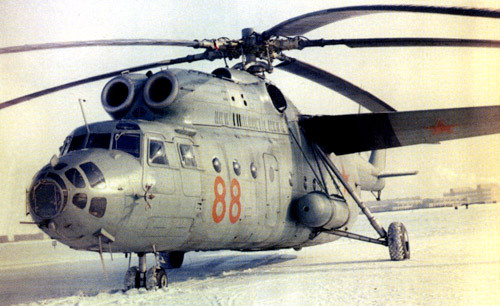 Mi-6VR (vodolei: Aquarius): Rotor systems testbed used in Mi-26 development; subsequently equipped as icing spray rig. 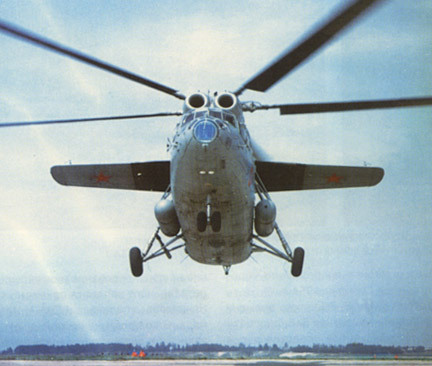 Mi-22 ('Hook-C'): Developed command support version with single large dorsal blade antenna on forward part of tailboom; small antennae under fuselage; pole antenna on starboard main landing gear of some aircraft. Also known as Mi-6AYa or Mi-6VUS in service. Mi-6AYaSh ('Hook-D'): Airborne command post; flat-panel (reportedly SLAR), forward of external fuel tank as starboard side, many small antennas. DESIGN FEATURES: Five-blade main rotor and four-blade tail rotor. Main rotor blades each have tapered steel tube spar, to which are bonded built-up metal aerofoil sections. Conventional transmission. Main reduction gearbox drives tail rotor, fan AC generators and hydraulic pumps. Intermediate reduction gearbox fitted with special fan. Two small cantilever removable shoulder wings mounted above main landing gear struts, offload rotor by providing some 20% of total lift in cruising flight. Tail rotor support acts as vertical stabiliser. FLYING CONTROLS: Blades have coincident flapping and drag hinges and fixed tabs. Main rotor shaft inclined forward at 5� to vertical. Control via large welded swashplate. Hydraulically actuated powered controls. Main rotor collective-pitch control interlocked with throttle controls. Variable incidence horizontal stabiliser near end of tailboom for trim purposes. STRUCTURE: The fuselage is a conventional all-metal riveted semi-monocoque structure of pod and boom type. 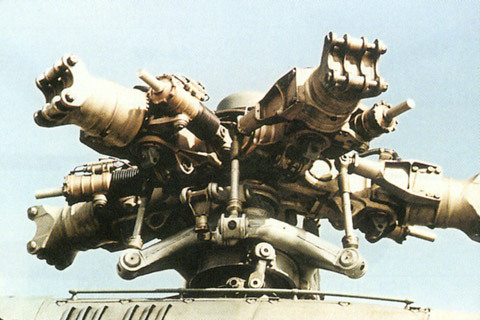 POWER PLANT: Two 4,101kW Soloviev D-25V (TV-2BM) turboshafts, mounted side by side above cabin, forward of main rotor shaft. There are 11 internal fuel tanks, with total capacity of 6,315kg, and two external tanks, on each side of cabin, with total capacity of 3,490kg. Provision for two additional ferry tanks inside cabin, with total capacity of 3,490kg. ACCOMMODATION: Crew of five, consisting of two pilots, navigator, flight engineer and radio operator. Four jettisonable doors and overhead hatch on flight deck. Electrothermal anti-icing system for glazing of flight deck and navigator's compartment. Equipped normally for cargo operation, with easily removable tip-up seats along sidewalls. When these seats are supplemented by additional seats installed in centre of cabin, 65 to 90 passengers can be carried, with cargo or baggage in the aisles. Normal military seating is for 70 combat equipped troops. As an air ambulance, 41 stretcher cases and two medical attendants on tip-up seats can be carried. One of the attendant's stations is provided with intercom to flight deck and provision is made for portable oxygen installations for the patients. Cabin floor is stressed for loadings of 2,000kg/m2, with provision for cargo tiedown rings. Rear clamshell doors and ramps are operated hydraulically. Standard equipment includes an electric winch of 800kg capacity and pulley block system. Central hatch in cabin floor for cargo sling system for bulky loads. Three jettisonable doors, fore and aft of main landing gear on port side and aft of landing gear on starboard side. AVIONICS: Comms: VHF and HF communications radio, intercom. Flight: radio altimeter, radio compass, three-channel autopilot, marker beacon receiver, directional gyro and full all-weather instrumentation. 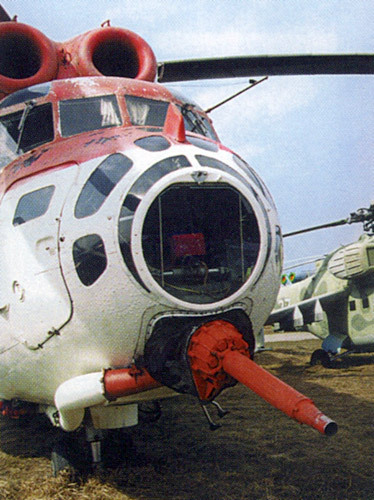 ARMAMENT: Some military Mi-6s have a 12.7 mm machine gun in the nose. 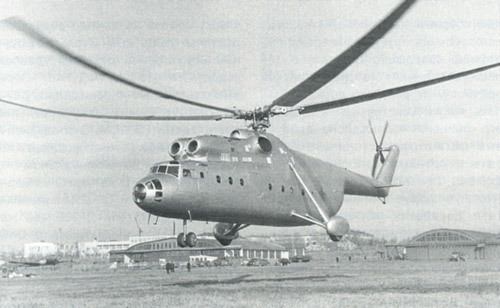 The Mil Mi-6, which has the NATO reporting name Hook, was first announced in the autumn of 1957, and has enjoyed a number of distinctions: at one time or another the type has held 14 world records; for 12 years it was the world's largest helicopter; it was also the world's first twin-turboshaft helicopter, and the first to exceed 300km/h in level flight. 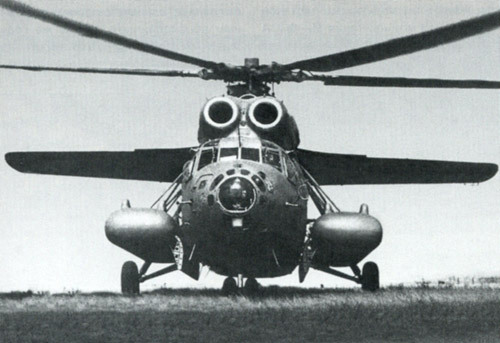 The Mi-6 bears a marked similarity to its predecessors in the Mil helicopter family, but is considerably larger than its immediate antecedent, the Mi-4: rotor diameter is 66% greater, and maximum weight over four times greater. The Mi-6 was designed to meet a joint military and civil requirement, the latter being concerned mostly with providing Aeroflot with a resources-support helicopter, able to operate in Siberia and to carry trucks, drilling rigs and so on. Design began at the end of 1954, and the first of five prototypes took to the air in the autumn of 1957. 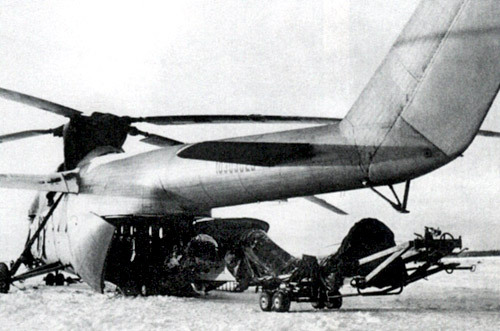 The type's record-breaking career began on October 30 of the same year, when an Mi-6 lifted 12,000kg to 2432m. Construction is wholly conventional: the fuselage is a metal semi-monocoque pod-and-boom design, with large hydraulically operated clamshell doors at the rear of the pod. These doors, which can be removed to allow the carriage of outsize cargoes, cover an opening measuring 2.65m by 2.7m and leading into a hold with a volume of 62m3, measuring 12m by 2.65m by 2.5m. Freight is handled with the aid of an 800kg winch. As an alternative to internal freight, a load of 9000kg can be carried in a sling suspended from a cable on the aircraft's centre of gravity, dropped through a hatch in the floor. 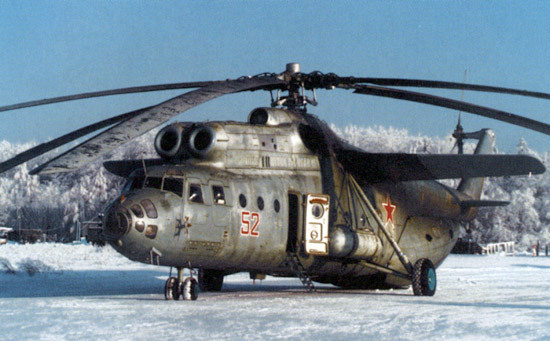 The Mi-6 also has an electric winch for use when hovering which has a capacity of 500kg. When the Mi-6 first appeared, it was claimed to have a maximum passenger capacity of 120, with normal capacity for 70 to 80, each with 20kg of baggage. Such an airliner was built in 1967, but failed to proceed beyond the prototype stage. The standard capacity of 65 passengers in the convertible current model is provided with tip-up seats along the cabin walls and with removable seats on the floor. Some 20% of the aerodynamic load is carried on stub wings measuring 15.3m in span. To save weight and increase payload, these wings are detached when the type is operated as a flying crane. For normal operations they can be fixed at either of two angles of incidence. The wings are also removed in the fire-fighting variant, which can carry 12,000kg of water. The prototypes were powered by two 4635shp Soloviev TV-25VM turboshafts, but production models have the 5500shp Soloviev D-25V developed models. Also fitted is a 100hp AI-8 auxiliary power unit for starting the engines in the absence of any external power source. The developed engines, which keep their rating at altitudes up to 3000m and so make possible operations in 'hot and high' conditions, also allowed some notable records, the most impressive being an altitude of 2840m with a 25,105kg payload on May 28, 1965. 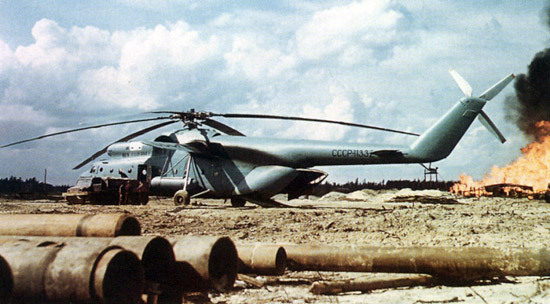 From the Mi-6 was developed the Mi-10 as a specialized flying crane, which first flew in 1960. 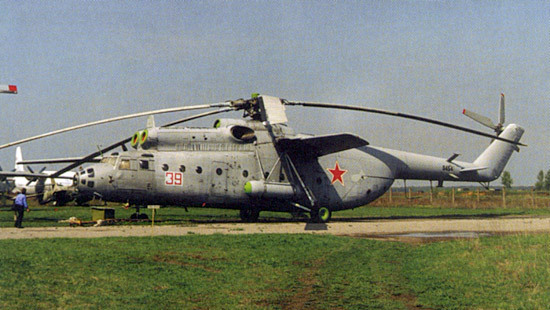 The Mi-10 is 31.8cm shorter than the Mi-6, but otherwise dimensionally similar. 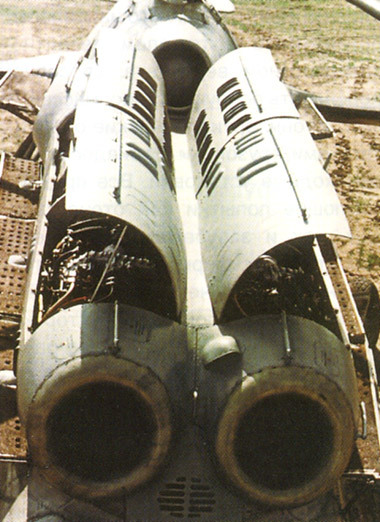 The fuselage is much shallower, however, and the Mi-10 is fitted with a stalky quadricycle undercarriage. In 1966 there appeared the Mi-10K, basically similar to the Mi-10 except for its shorter undercarriage legs, a chin gondola for a second pilot to control hover-loading operations, and uprated 6500shp Soloviev D-25VF turboshafts in fully developed models. 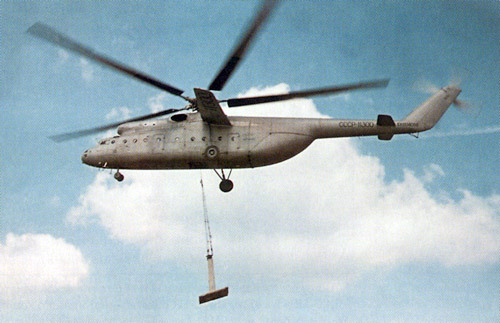 This allows a payload of 14,000kg in the slung mode, compared with the Mi-10's 8000kg. Three blonde women were stranded on an island. While trying to dig their way out, one of them came across a buried lamp. Suddenly a genie appears and offers to grant each one of them one wish, in return for saving him. 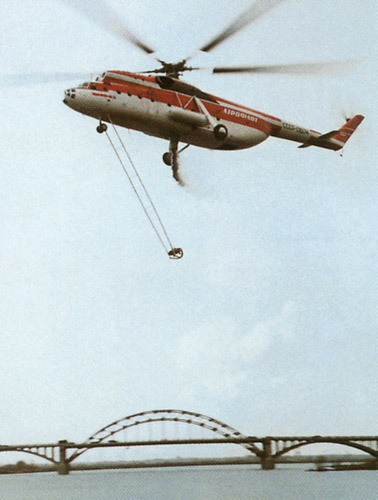 � In 1961 the Mi-6 lifted 20117kg to a height of 2738m and flew at 340.15km/h over a 100km circuit. 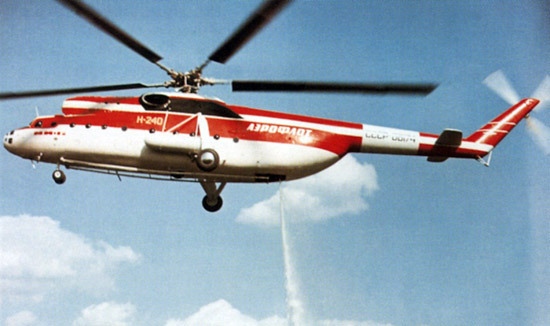 � The Mi-6P was a firefighting version with a water tank, but it did not have stub wings. � By 1990 Aeroflot Mi-6s had carried 15 million tonnes and 12 million people. 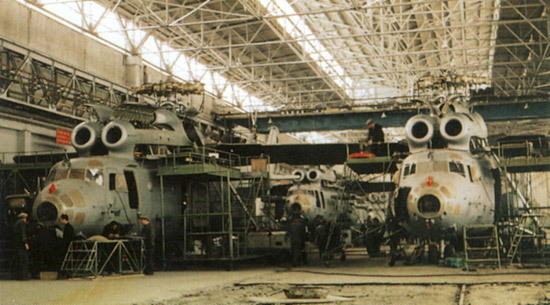 � Mi-6 export customers included Algeria, Bulgaria, Egypt, Ethiopia, Iraq, Libya, Peru, Syria and Vietnam. 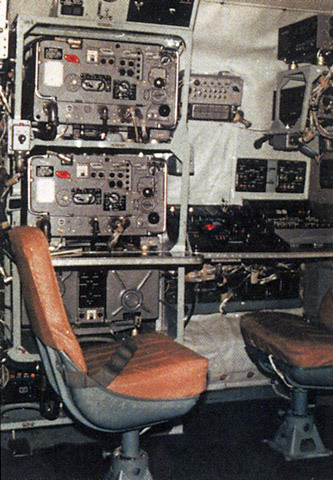 � The Mi-6R was a radio command post containing eight tonnes of equipment. 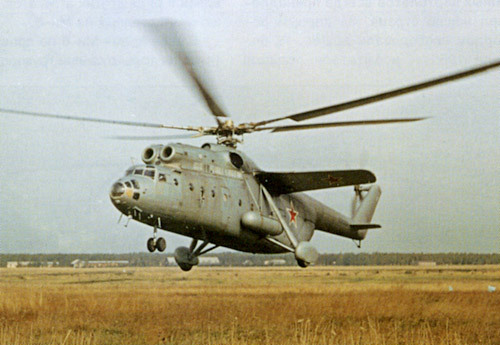 � The Mi-6's main rotor revolved clockwise at 120 rpm.